New York, home to over 8.5 million people, has roughly 1.6 million residents who lack broadband connectivity. The United States is home to many of the world’s biggest tech companies including Apple, Amazon, Google and Facebook. Yet almost a quarter (23%) of urban Americans – nearly 62 million citizens – do not have access to broadband. 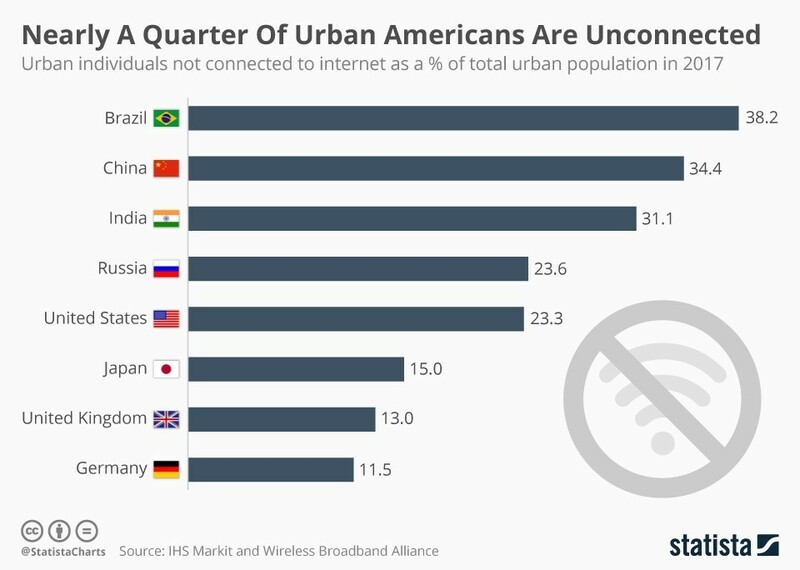 This is a similar proportion to Russia, where almost 24% of the urban population lack broadband access. The chief barriers to connectivity are quality of internet and affordability. A lack of IT literacy also poses a concern. That is according to a report by IHS Markit and the Wireless Broadband Alliance (WBA), which identified what percentage of people from urban areas in eight countries lacked access to broadband. The report also analyzed connectivity in five cities, including in London where just 7%, or 625,000 of almost 8.8 million residents, are without broadband. In New York, the most densely populated city in the US and home to over 8.5 million people, roughly 1.6 million residents lack broadband connectivity, as the table below demonstrates. To tackle this, New York is focusing on providing people with IT and technology skills, as well as providing improved internet access throughout the city. For example, the OneNYC initiative, launched by mayor Bill de Blasio in 2015, aims to provide every resident and business in New York with access to adequate and affordable broadband by 2025. Last year, the project helped provide free Wi-Fi to around 3,500 residents, and offered dedicated support for senior citizens as well as for young people and their families. Another project launched by the de Blasio administration, called LinkNYC, included repurposing New York’s payphone infrastructure with free Wi-Fi. According to LinkNYC, at least 7,500 payphone kiosks will be installed in the city by 2025, providing superfast broadband for residents. The report also highlights the digital divide among those from rural areas, where the average proportion of unconnected people across the eight nations analyzed is 44%. In addition to lower rates of connectivity, rural populations often have to contend with less reliable and slower internet than those living in towns and cities. In the US alone, well over 16 million residents from rural areas lack broadband, which is equivalent to 28% of the rural population, as the table below highlights. Social change organization Connect Americans Now (CAN) is trying to tackle this issue, promising to bring reliable and affordable broadband to all Americans living in rural areas by 2022. According to CAN, the most effective way to improve connectivity is via a combination of wired and wireless technologies, and by leveraging a range of bandwidths, such as the 700 MHz frequency range. The group claims this would enable wireless signals to travel over hills and through buildings and trees. Challenges in rural America, however, are far less pronounced than in other nations, particularly in India where 87% of the rural population lacks broadband access. Fortunately for its citizens, India has developed plans at a country-wide level to expand digitization and develop “smart cities”. Its Smart Cities Mission and Challenge project includes retrofitting and redeveloping existing areas to improve communications infrastructure and broadband connectivity. However, it is the UK and Germany that lead the charge in terms of rural connectivity. Almost 90% of residents in rural Britain have access to broadband, while in Germany around 82% of the rural population is connected.